Deputy Prime Minister Sok An, a ruling party stalwart who has been likened to “a Hindu god with 48 arms” for his control over a dizzying array of government bodies, including the Council of Ministers, died in Beijing on Wednesday evening. He was 66. His death came after long speculation about his health, including false reports of his passing, and was announced in an official statement shortly after he died at 6:32 p.m. He had been hospitalized for months. 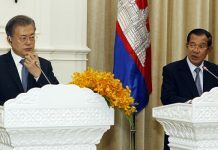 “The Royal Government of the Kingdom of Cambodia is very saddened to inform the civil servants, all kinds of the armed forces and the public that Samdech Vibol Panha Sok An, a member of the National Assembly, deputy prime minister and the minister in charge of the Council of Ministers, passed away,” the statement said, explaining only that he had succumbed to an illness. His body was set to be returned to Cambodia early this morning, according to government mouthpiece Fresh News, while Prime Minister Hun Sen, who traveled to China this week, formed a committee headed by Deputy Prime Minister Bin Chhin to oversee his funeral. 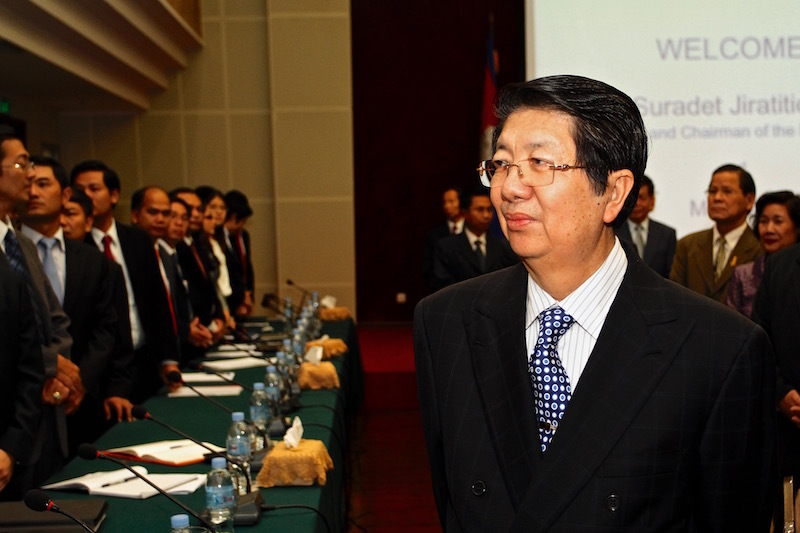 Sok An was a key operator in Prime Minister Hun Sen’s consolidation of power over the past four decades. 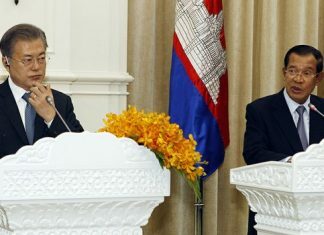 The two began working together shortly after the fall of the Khmer Rouge in 1979, when Mr. Hun Sen became foreign minister of the Vietnamese-backed socialist government. Sok An became chief of cabinet at the Foreign Ministry in 1982, three years before Mr. Hun Sen was promoted to prime minister, and continued to climb the ranks until the position of minister in charge of the Council of Ministers was created specifically for him. After briefly serving as ambassador to India in 1985, Sok An returned home as one of the Phnom Penh government’s chief negotiators in peace talks that eventually led to the signing of the Paris Peace Agreement in 1991 and democratic elections two years later. Taking on the role of cabinet chief of the Council of Ministers in 1993, he was named deputy prime minister in charge of the council in 2004. Council of Ministers spokesman Phay Siphan said his boss would leave behind a legacy of helping restore peace to Cambodia, overseeing border negotiations with Cambodia’s neighbors after decades of war, leading talks to establish the Khmer Rouge tribunal and spearheading efforts to preserve the country’s heritage, including the successful campaign to have the Preah Vihear temple listed as a Unesco world heritage site. 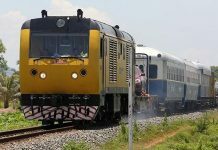 “The whole country, even the opposition parties, can take pride in that,” Mr. Siphan said, adding that Sok An had also led efforts to form the International Coordinating Committee to protect the Angkor Archeological Park in his role as head of the Apsara Authority, which oversees the temples. He also successfully campaigned for the return of Khmer antiquities looted during the country’s decades of turmoil. Others, however, will remember Sok An as a shrewd power-broker whose personal wealth and power rose in tandem with that of Mr. Hun Sen and fellow party leaders. “The story of Sok An’s rise to immense wealth and power is intricately linked with that of Hun Sen, the man he served loyally over the decades,” Sebastian Strangio, author of “Hun Sen’s Cambodia,” wrote in an email. Sok An, who for years controlled the Cambodian National Petroleum Authority, featured heavily in the 2009 Global Witness report “Country for Sale,” which examined the many ways the ruling party exerted control over all aspects of the extractive industries. Sok An saw his fiefdom trimmed following the 2013 election, when the petroleum authority and more than a dozen other institutions, such as the accreditation body that oversees universities, were moved from his control to relevant ministries. Sok An was born in Takeo province in 1950. He became a teacher at a junior high school after completing his education, and boasted of becoming its deputy director at the age of 22 due to his graduate degree in literature and a year spent studying law. When Pol Pot rose to power, he was forced to enroll in “the school of the Khmer Rouge,” he said in a speech in 2013. Little has been written of his time under the regime, however. Among his most important roles over the decades would be leading talks to form an international court to try senior Khmer Rouge leaders. He was present during the first meeting between the government and the U.N. in 1999, only a year after the final remnants of the communist guerillas laid down their weapons. For all the tribunal’s successes, including guilty verdicts for three Khmer Rouge officials that few thought they would ever see, Sok An also embodied its shortcomings. From the beginning of the negotiations, it was made clear that the Cambodian government—led by former Khmer Rouge cadres including Mr. Hun Sen—was going to ensure its control over the court. He is survived by his wife, Theng Ay Anny, and five children, including his son Sok Puthyvuth, who is married to Hun Maly, the prime minister’s younger daughter, making him one of the best-connected businessmen in the country.